Written by Guy Bentley for the 'Your Village' magazine, mid 1970’s. Take a deep breath, now look and listen while we take a stroll through our village street, mid June, about 1910; I am a small boy about 7 years old, just old enough to take an inquisitive interest in the activities of the grown-ups in our village. Meet me outside Newlands Farm at about five minutes to eight. The sun is shining, the birds singing and faintly in the distance you can hear the chatter of a mowing machine cutting the grass to make hay (the tail grass always cuts cleaner while the morning dew is still about). Listen, if the wind is in the right direction we shall hear: dong, dong, dong, dong, eight times. 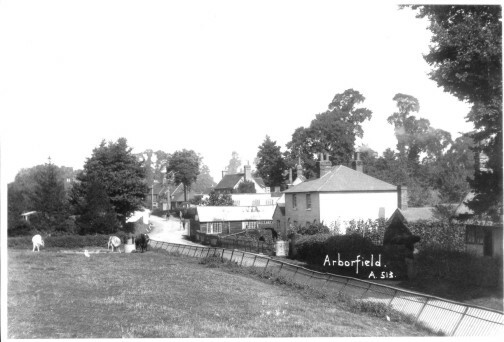 This is the clock at Arborfield Hall striking eight; the man looking over the fence in the farmyard is Mr Charlie Lucas. He is checking his watch, as will most of the locals, for Arborfield Hall clock keeps very accurate time. 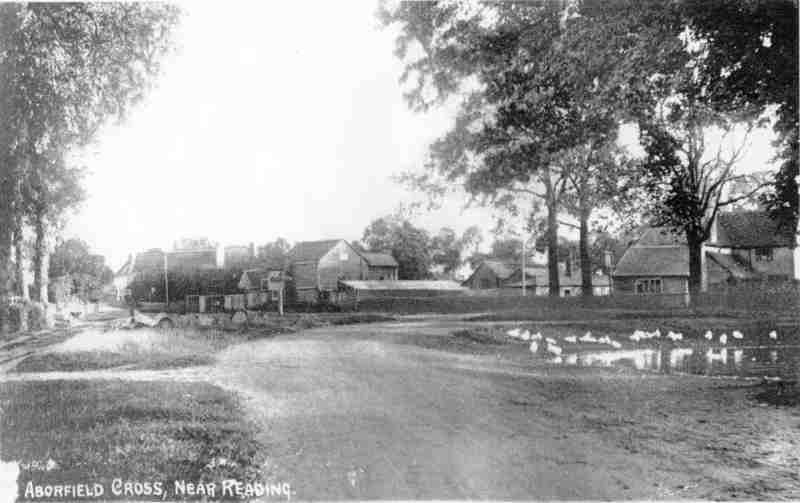 Mr Lucas has just fed a dozen fine young bullocks in the stockyard that he is fattening for the Fatstock Market in Reading just before Christmas. There is very little activity in the farmyard, as most of the farmhands have been working in the fields for nearly an hour already. 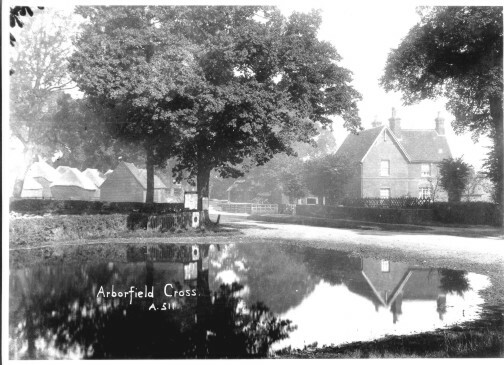 We now move on for about fifty yards and stop at the village pond, where cattle and horses drink; the ducks on the pond going about their business with their rear ends up in the air, their beaks very active beneath the water after minnows, tadpoles and other creatures that live in the pond. On the far side of the pond in a clump of rushes you will see Mr and Mrs Moorhen and some newly hatched chicks darting about playing amongst the rushes and pond weeds. There is a natural springing at the further side of which keeps the water quite clear in spite of the many animal feet that walk through it during the day. This is where the children slide when the water is frozen for several days during the winter. Pond Cottages overlook the pond and the one on the right is the home of Mr, or PC, Prior the local policeman. He is well liked by the majority of the local inhabitants. Just inside his gate is the POLICE NOTICE BOARD upon which are all the 'Official Notices' and local Byelaws. His main problems are the occasional case of drunkenness, gipsy intruders, poachers and small boys who, in those days, require to be reprimanded for occasional mischief. 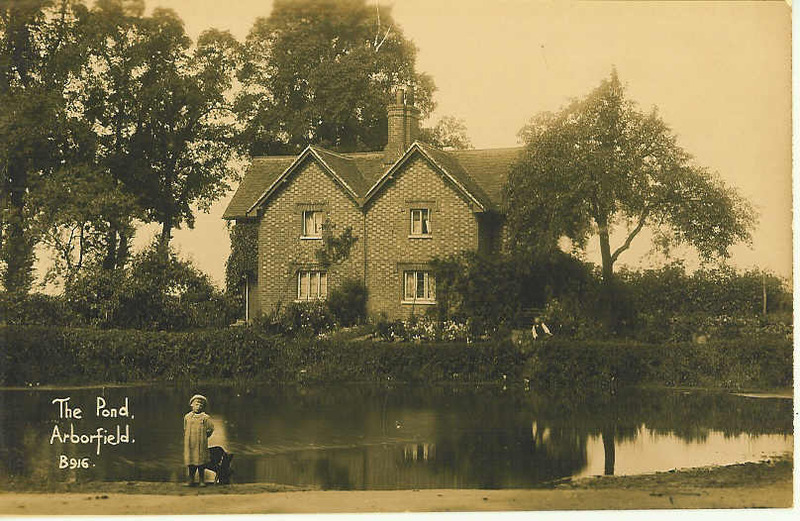 His garden is very tidy and well cultivated and makes a very pleasant background to the village pond, In the house next door lives Mr Arbery, butler to Mr John Simonds of Newlands, who owns most of the property in Arborfield and Newlands. 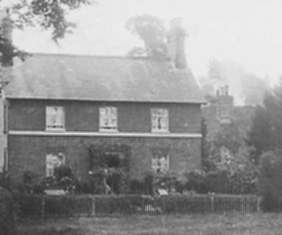 This house, until a few years ago, was the home of a Mr Haines, the constable before Mr Prior. Before we come to the main road, there is, on the right-hand side, a triangle of grass where there are two horse chestnuts and one very large oak tree. On the three sides of the triangle there are hard surfaced gravel roads. 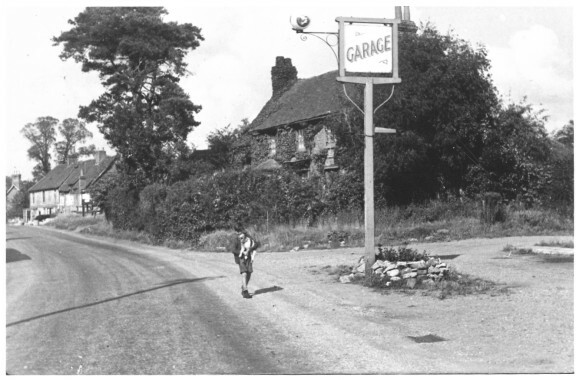 Over the main road to the Bull Inn; the landlord is Mr Joseph Bushell. He has not been in the "Bull" very long; before he came, the landlord was Mr Rayner. Mr Bushell will no doubt be out on his rounds of the woods to keep an eye on the pheasants and other game. He will have several bags containing corn, which he will scatter in the woods to encourage the birds to nest and remain within the cover. Strapped to the cross-bar of his bicycle is a double barrel twelve bore shotgun and the bag slung over his shoulder contains the cartridges to have a shot at the numerous wildlife that prey on the game birds, mostly weasels, stoats, jays and magpies. Most of the pheasants have been hatched and reared in the paddock adjoining the "Bull". In the spring, Mr Bushell will have visited local farmers and those who keep poultry to collect broody hens under which the pheasants' eggs will have been hatched. 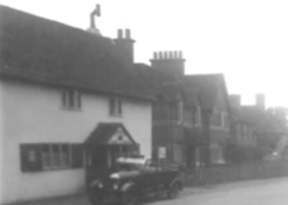 Opposite the "Bull" there is a single storey building, which contains almshouses, property of the Parish Council. The one on the right is occupied by an elderly widow, Mrs Love, and the one next door, by Polly Lunn (a local character) and her elderly brother, Alfred. Both are simple folk, but with odd jobs they do within the village and some assistance from the Board of Guardians, they always appear clean and tidy. Now on to the builders' yard to the right-hand side of the 'street'. The local builders, the Garrett Brothers, Arthur, Alf and Ted - three very popular members of the Cricket Club. 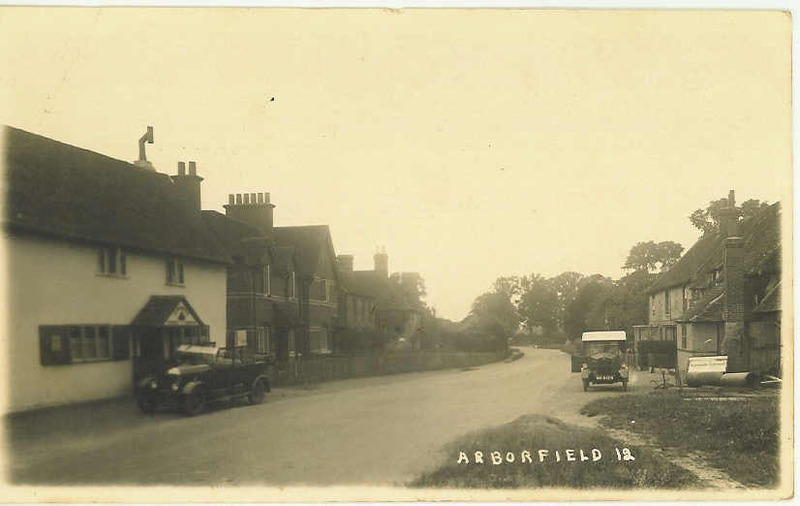 Arthur is also Clerk to the two separate Parish Councils of Arborfield and Newland. In their yard a horse-drawn van is being loaded with building materials; they will be off to do some house repairs or to decorate the outside or inside of one of the local houses. 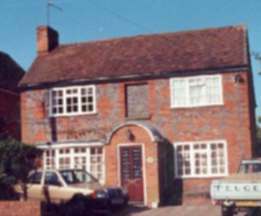 There are several cottages within the village that were built by Mr George Garrett, father of the present brothers. The Garretts' house is next adjoining their yard. 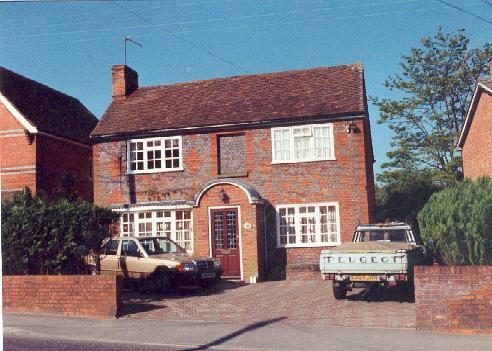 Across the road is the most imposing house in the village street, facing straight down the Reading Road. Look over the front hedge - the garden is laid out in small beds to an artistic design and bordered by small box hedging about eight inches high - all beautifully clipped - and the beds are planted with begonias. If the front door is open, look inside and you may see Mr Arthur Taylor, the local tailor, sitting cross-legged on a very large table, making a hand suit of breeches or perhaps a jacket of 'Hunting Pink' for a local landowner or farmer. It is reputed that any article of clothing made by Mrs Taylor is probably pressing a garment made by her husband with a huge iron, heated on the hob built into the wall at the side of the tailor's workroom. Arthur is another stalwart member of the Cricket Club. Now back to the other side of the street. 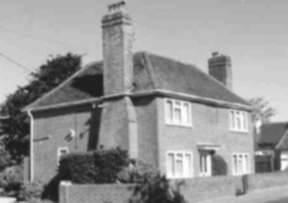 There are two cottages adjoining the Garretts' house; one is occupied by Mr and Mrs Alexander. Mr Alexander could be just coming out of his gate wheeling a bicycle, dressed in a smart green uniform with peaked hat and a black band over his left shoulder across his back and under his right arm - like a bandolier with a small oblong pack attached to it, which I understand contains first aid requirements - for he is the first AA Patrolman in the district. His beat is from Reading to Eversley Bridge, to assist any unfortunate motorists whose vehicle has a puncture or has broken down. This is not at all uncommon as all the roads are gravel surfaced and the odd nail or stud that has dropped from the many horse-drawn vehicles that go to and fro through the street may find its way into a tyre. Now we are outside the last cottage of the block. 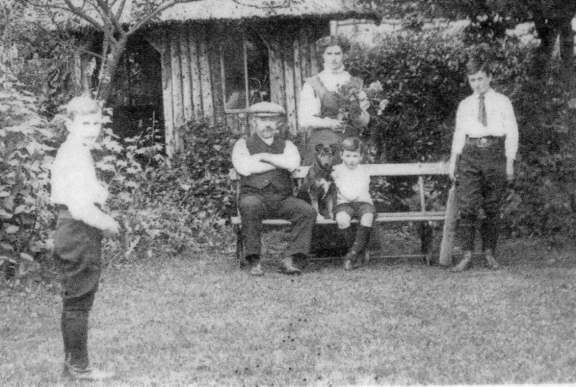 Here lives Mr and Mrs William Cox and their young son, Young Willie Cox, Arborfield's first telegraph boy, with his new red bicycle. 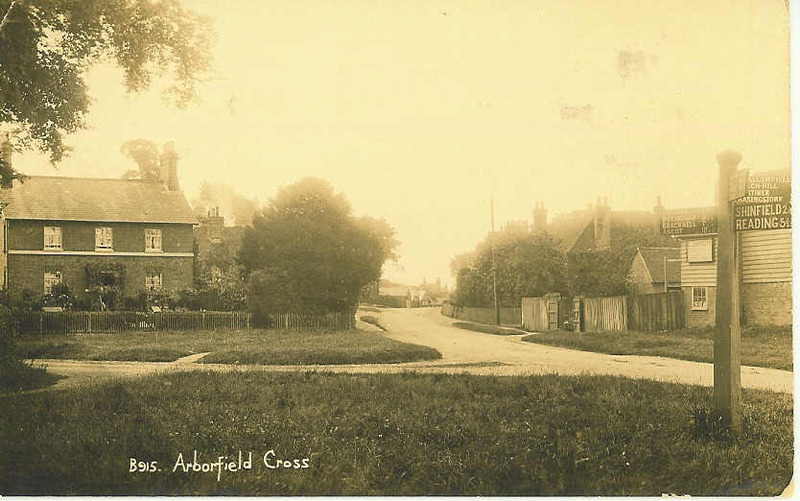 He will deliver telegrams from Arborfield Cross Post Office over a wide area - Farley Hill, Bearwood and Sindlesham, Barkham and as far as West Court on the Eversley Road. His father works for the Garrett Brothers and is also the Sexton at Arborfield Church. As Garretts are the Undertakers, this works very well, as the Sexton is required to toll the knell when there is a death in the parish, and to dig the grave and complete the task after the funeral service. 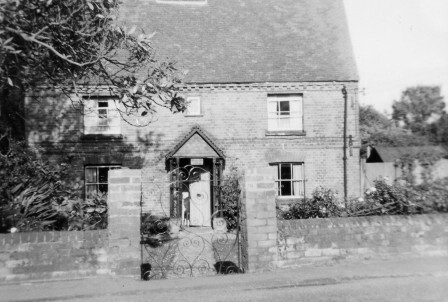 Next-door 'Mileham Cottage' built by old Jim Taylor, named after his wife who was a Miss Mileham. Jim was a bricklayer by trade, working for the old George Garrett. He built the cottage for himself and lives there with his two daughters. Both girls are teachers at Arborfield School, Nell the elder and Frances, who as well as teaching, is the Organist at Arborfield Church. 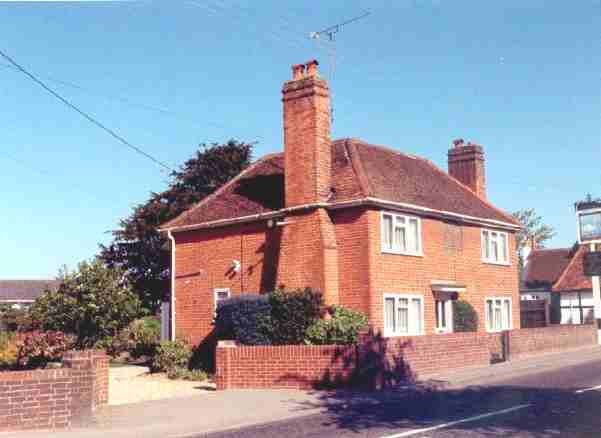 Across the road is a footpath that goes past three cottages to School Road. The first is occupied by the Mabett family; Mr Mabett is a chauffeur to Mr John Simonds. Next-door Mr and Mrs Chambers, Edward (or Teddy as he is generally known), is a carpenter, a skilled craftsman working for the Garrett brothers. Any carpentry completed by Teddy is a work of art, perfect in every detail. He is also a member of the Cricket Club - a very safe pair of hands behind the wicket. 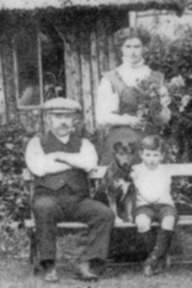 Next door again, live Mr and Mrs Charlie Selwood and Charles their son, known to everyone as Sammy. Both men work for Mr Lucas. Back now to the main road. 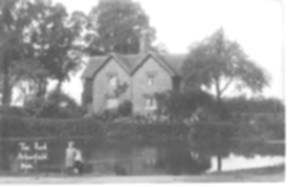 Adjoining the Mabetts' cottage is one occupied by Harry Salisbury, a widower with several children. He is a farrier working for Mr Mattingley just a little further on beyond the Post Office. 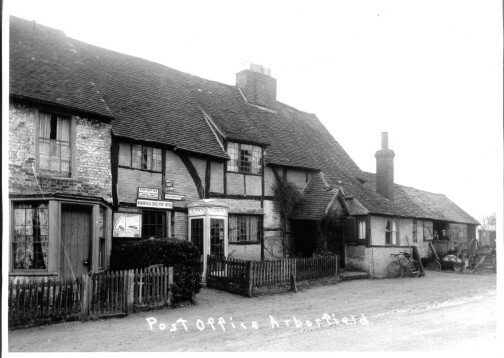 It is only recently that Arborfield has a proper Post Office, with a counter and telegraph facilities, with a small switchboard to the few houses in the area that boast a telephone. Mrs Mattingiey is the Postmistress; before, all postal business was conducted in the living room within the house. You can see the slot in the front door where letters were posted - at the time of writing the original door is still there! 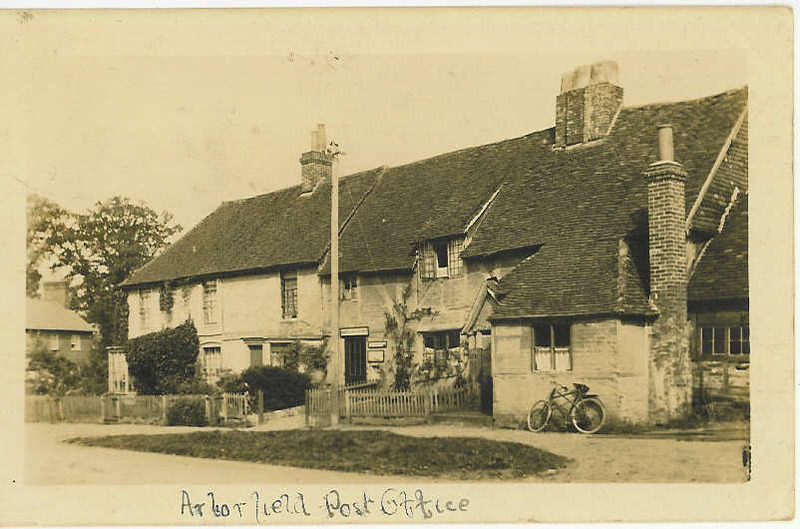 Arthur Emblen is the Postman known to everyone as 'Plummy Emblen', he lives in Swallowfield Road. When out of uniform he repairs boots, shoes and harness in his little workshop, in his spare time. 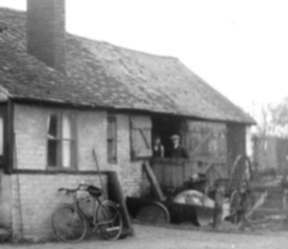 Next to the Post Office is the Blacksmith's Shop, owned by Mr Mattingley. All day long from dawn to dusk you can hear the ring of the anvil. Mr Salisbury will be shoeing a horse - each shoe is made individually from a bar of iron and fitted with great care. You can smell the tang of the burning hoof as it is fitted and trimmed. There is probably another horse standing outside waiting its turn, and, during the holiday time groups of children stand and watch and listen to the conversation that Mr Salisbury keeps up with them and the horses - and language that only horses are supposed to understand. 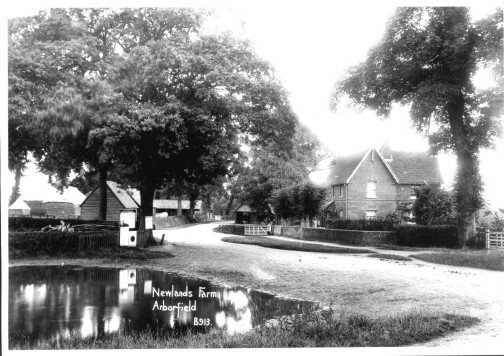 Opposite are the two cottages built about twenty years ago by George Garrett; they are tied cottages for the employees of Newlands Farm, Mr Hall in one and the other awaiting a new tenant. 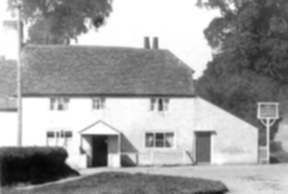 Now we have the Swan Inn, Landlord Mr William Clark, a retired sergeant major and a very strict man who has retained his military bearing and discipline at all times. He has a very large garden, keeping several pigs in a big sty in the garden, and in the yard at the side of the inn there is stabling for several horses and also a large coach house. Mr Clark has no horses but the buildings are used to house poultry - hens, ducks and geese. From time to time a travelling 'Cheap Jack' sets up his booth in the yard, selling pots and pans, china and crockery, cutlery, cut throat razors, boot and shoe laces, and a hundred and one other household requirements. For the children there are dolls, toys and a very sticky toffee, which we call 'stick-jaw', aniseed balls and butterscotch. At night his display is illuminated with two paraffin oil flares and that, with his cries of "Walk up, walk up, ladies and gentlemen!" makes quite a gay setting to the "Swan". 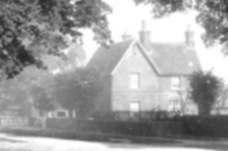 You will have noticed many schoolchildren crossing the green opposite, going by the footpath across Mr Isaacs' field to school. They have come from many different directions, some even from Farley Hill and Maggs Green, and some whose parents are poorly paid, wearing wooden soled clogs. These wear wonderfully well and easy for Dad to repair. All will be wearing satchels or if there is more than one in the family, the eldest will be in charge and wearing the satchel containing their dinner. It is not uncommon for some children to have eaten their food before getting to school, as hunger was well known in large families. At the side of the Green is the stable and coach house of what is now known as 'Birch House' - occupant Major O'Rourke — one of the first officers to arrive in the village attached to the new Army Remount Depot on property recently purchased by the Military Authorities. Major O'Rourke takes a keen interest in the local Boy Scouts, organising paper chases, athletics and boxing. He is very keen on self-defence and has provided boxing gloves and gives instruction, acting as Referee and peacemaker when fisticuffs get a little rough. There has been many a bloody nose on that piece of grass. On the other side of the road a house occupied by Mr Palmer with his wife, son and daughter, Frank and Minnie. Mr Palmer is baker to Mr Seymour at the village shop. The bread that he has made sends a wonderful smell along the street. He would have been at work for over three hours now and from seven o'clock when the first batch of bread came from the oven the smell of hot new bread has been whetting the appetites of passers by. The loaves will be loaded into two carts to deliver bread and flour throughout Arborfield and Newland, Farley Hill and parts of Barkham. Now to the Wheelwright's workshop on the left hand side of the street belonging to my father, George Bentley, known to his fellow members of the Cricket club as 'Chummy'. He has been a bell ringer with the Garrett Brothers and others, following their fathers, when the new church was built in 1863. 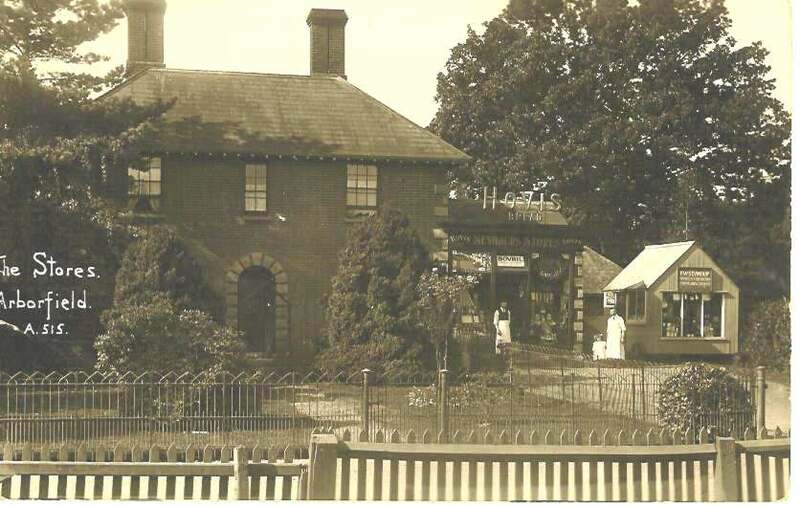 The Wheelwright's business has belonged to our family for many years; there is no record of when the business first started, but it was known that the Bentleys had lived there well before 1800. In the late 1800's the business was carried on by Mr William Vincent, coachbuilder, who later was the founder of 'Vincent's of Reading' in Castle Street. It was returned to my father in 1903. If you look through the large double doors you would see farm cart or wagon being made or repaired, milk floats, wheelbarrows, and ladders and many other implements for an estate or farm in the surrounding district. Each item or vehicle was given a primary coat of paint before being put in the paint shop for its second and final coat of paint and a final coat of varnish. If you listen you will hear Alfred Attwood in the Blacksmith's shop at the back of the workshop making all the ironwork required for whatever is being made in the Wheelwright's shop. (Before Alfred, the Blacksmith was William Harding who has worked there since boyhood and is now in his eighties. He could neither read nor write but his skill with ironwork was wonderful). Like all Blacksmiths he wears a leather apron to prevent the sparks from the red and often white hot iron burning his clothes. Mr Charlie Cox is the Wheelwright, a very gentle man but skilled and industrious, a perfect timekeeper, never a minute early or late. On the other side of the road is a stable for our horses, Joe and Coker, and two sheds for our own vehicles. A large open-ended shed has just been built for the seasoning timber. 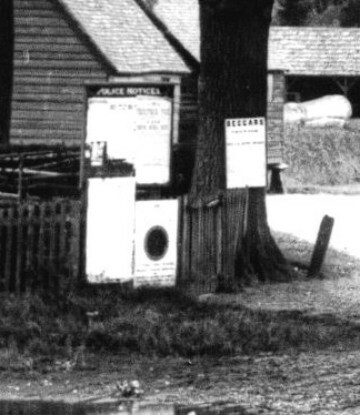 Outside in the paddock there are many trunks or butts of trees that are laid out awaiting the arrival of a mobile saw bench drawn by a big traction engine belonging to Mr Dixon of Finchampstead. The trees will be sawn into planks of various thickness, ash, oak and elm to any thickness from three to six inches and softer wood from by two down to less than an inch. The planks will be laid in the open-ended shed each with strips laid between and stacked one upon the other to 'season'. These are very carefully placed, with a spirit level, to make sure that when dry they can be used. Before the advent of the steam driven saw, the timber was sawn by hand in the saw pit in the yard, with a huge crosscut saw - one man at the top and one in the pit below; a very uncomfortable place to be in hot weather. Next is the house adjoining the wheelwright's shop, my home. The house has been in our family since some time in the 1700's except for a short time between 1875 and 1900. 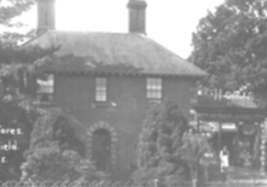 An uncle of mine was born there in 1826 and he was the youngest of the fourth generation to have lived in this house. On the brick pillar at the gate there is a brass plate, which reads "Doctors Walker and Halpin, Surgeons". Surgery is held in the sitting room of the house twice a week. Dr Walker is quite elderly and only treats patients at Swallowfield. Dr Halpin does his rounds on a motor bicycle; when he first came into the practice he rode a bicycle, but now talks of owing a motorcar. 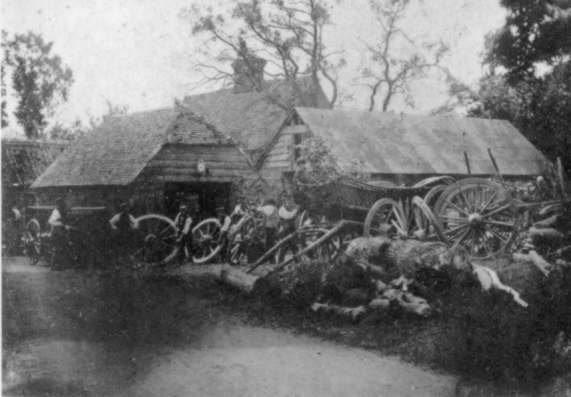 It is necessary to go to Swallowfield to collect medicine and this is usually done by bicycle or pony and trap. Now on the right hand side of the street is the village shop where most of the local inhabitants buy practically all their requirements - groceries, meat, bread, chocolate, sweets, tobacco, cigarettes, snuff, chewing twist, drapery, children's clothing, crockery, ironmongery, corn and meal for poultry and pigs, coal, paraffin oil and a hundred and one other items. Mr F.W. Seymour is the proprietor and he took over the business about ten years ago. Before Mr Seymour it was Mr Bundy and the previous owner was Mr Giles, and earlier still Mr Hart, the first baker in the village. The footpath next to the shop crosses the field to Arborfield Court and through to Wokingham Lane and Farley Hill. Mrs Bruce lives in the Court, only recently built and completed in 1906. In the summer time the walk across the fields is very popular and pleasant. On Sunday evenings it is possible to see several families going for a pleasant stroll through the woods to Farley Hill Church. If you stand by the pond in the corner of the field next to the gate, on fine evenings you may hear music, either a brass band or someone playing a musical instrument, or singing a well-known song. The sound is produced by a gramophone in the cottage across the footpath; it belongs to Mr and Mrs Harrington. This is the first gramophone that many village folk have ever heard and the records are cylindrical. It has a huge horn and when played by the open window the sound can be heard distinctly in the village. Over the road from the footpath is "Whitewell Cottage" built in 1847 by my grandfather. Up to a few years ago the village well, "Whitewell", was in the front garden of the cottages but as most of the village folk get their drinking water from the well, the fence has been moved behind the well, giving easy access without going into the garden. All day long from dawn to dusk men will be seen going to and from the well carrying two buckets either in their hands or on a pair of yokes across their shoulders, fetching water for drinking and washing. This is a natural spring. If you lift the lid you will see the well is practically full of clear cool water. It is just over five feet deep and has never been known to run dry. 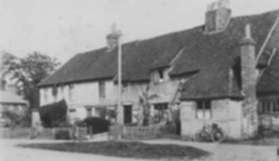 Now we have "Peacock Cottage", the only thatched cottage in the village street. In the garden is a yew tree clipped in the shape of a peacock. It is one of the oldest dwellings in the district with a wooden frame. Some of the walls are wattle and daub and what brickwork there is has been hand-made as the bricks vary in shape and size. There is a cellar beneath the bedroom with a spring in the corner, which obviously is connected to the "Whitewell". The District Nurse lives here, she is a widow, Mrs Hogg, with two children and she does her rounds on a bicycle. Looking at the surface of the road, there are several damp patches and there is a trickle of water running down the verge of the road. This comes from the spring in the bank; including the "Whitewell" there are several active springs here. It is a local belief that if we are due for a spell of fine weather the springs are more active. On the right hand side, situated on the bank, there is a danger sign. On an iron stake with a red triangle at the top, and beneath on iron plate with the words "WARNING - PLEASE DRIVE SLOWLY THROUGH THE VILLAGE". Quite frequently a horse and cart pass at quite a sharp gallop and several motorcars may go through during the course of the day, leaving a cloud of dust, blown up from the gravel road. There are no footpaths either side of the road for the full length of the village street. On the left hand side on the bank for about 100 yards there are several very large elm trees. The field over this bank is known as "Jagletts". We are now at the top of the hill, the highest point of the village street. During the summer holidays Mr Seymour allows us children to fly our kites from the field on the right; both home-made kites and those purchased in Reading or Wokingham, can be seen high in the sky towards the "Coombes". The prevailing wind is usually from the east and many a penny ball of string has been purchased from the shop for the larger kites that fly quite high and a considerable distance away according to the strength of the wind. Our stroll through the village has taken nearly an hour. At nine o'clock the school bell will ring and if you listen you will hear clip, clop, clip, clop, the sound of horses hooves and iron tyres on the gravel road. These are the milk floats returning from Wokingham Station to the local farms. The milk from last evening and this morning's milking have been taken in seventeen-gallon churns to the station and is now half way to London on the "Milk Train". From this spot in the winter on frosty mornings one can hear the trains shunting about in the Wokingham Goods yard at the station. Should the wind be in the east it is possible to hear the empty milk churns being unloaded on the platform, and the trains on their run between Sindlesham Halt and Wokingham. We now near the end of the "Village Street", just down the hill are a pair of cottages built for Mr Hart at the shop. Mr Hart was the first village baker in about the 1880's. He delivered the newly baked bread through the district carrying the bread in two large baskets, which he carried on his arm. 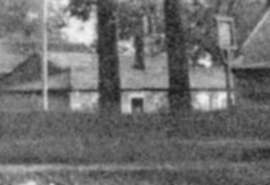 The cottages are occupied by Mr Tom Edwards, an employee at the Remount Depot. Next door lived Mr and Mrs John Humphries and he is the "Road Man". 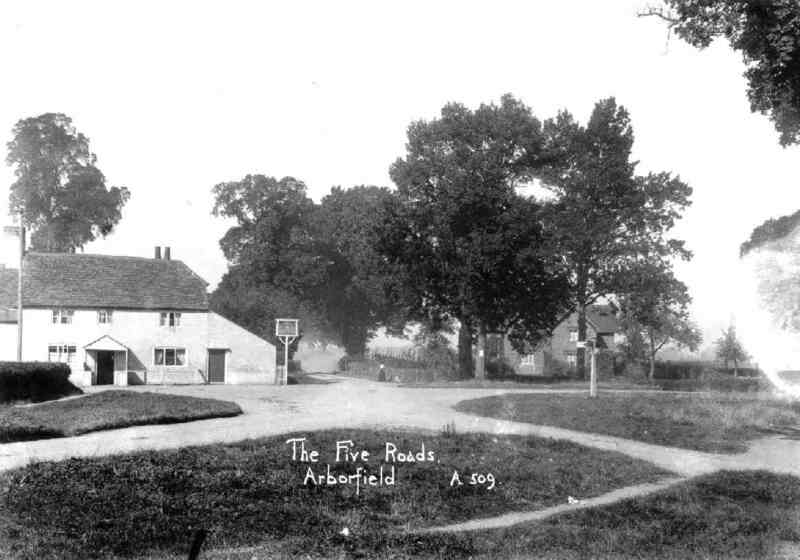 Heaps of gravel are put at convenient places by the road from the Parish boundary between Shinfield and Arborfield to the Farley Hill turning on the Eversley Road, and John with his wheelbarrow, pickaxe, shovel and hammer, repairs the pot holes as they appear throughout the village. Mrs Humphries is one of the wonderful women who are found in villages throughout England, taking in washing, acting as midwife and nurse (before the arrival of Mrs Hogg) and also there when there is a death in the village to comfort the bereaved and to do the laying out. She can be seen going from one of her many 'good deeds' always wearing a spotlessly white pinafore and carrying under her arm the tools for whichever task she had or was about to perform. 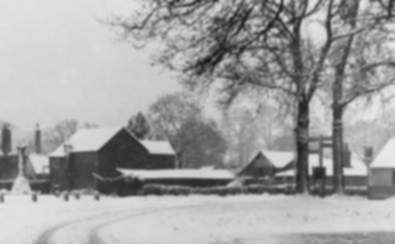 Opposite to Harts Cottages is the chapel - Arborfield Free Church, with its stable and coach house at the back. The preacher usually comes from Reading in a pony and trap. Several locals often take both the morning and evening services. There is always a good attendance, and on Sundays when the weather is warm enough the windows are open wide and the vocal effect of both the preacher and congregation can be heard for some distance away. One evening during the week there is 'Band of Hope' for the younger generation. Notes: Many surnames listed in this article are now commemorated in street names on the Penrose Park estate. Others (e.g. Emblen, Anderson, Hart) are found in the centre of the village. If you have any other photographs we could use to illustrate this article (e.g. 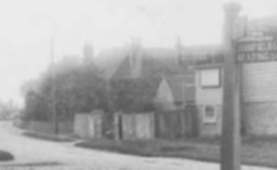 the front of the wheelwright's shop, the Free Church or the fields now occupied by the Link Way estate and Hillcrest), please contact us. Also, how about someone describing a stroll through the village in the 1940's, or the late 1950's immediately prior to the building of Link Way?